Forrester produced a well-covered report this week announcing that Enterprise 2.0 will be a $4.6 billion business by 2013. In my RSS feed of FriendFeed updates containing the term Enterprise 2.0, there were probably a couple hundred related to this report – Google Reader shares, bookmarks, Twitters, etc. Sarah Perez of ReadWriteWeb has a great post about the Forrester report, with dollar figures. About a month ago, AIIM came out with its own report on the market for enterprise 2.0. It was a work produced in conjunction with the likes of Stowe Boyd and Andrew McAfee. After reading both of these reports, it’s clear there is a common perspective out there, but some differences worth noting as well. It’s instructive to look at both. Forrester is paid for its expertise and forecasting. Their reports are well-regarded in this regard. Based on surveys of over 2,200 companies, this report is a forecast of the dominant technologies of Enterprise 2.0. Grounded in the market, fueled by its analysts’ views. Forrester’s report strongly cleaves the Enterprise world into internal facing and external facing uses. AIIM’s goal seems to be more of an Enterprise 2.0 temperature check of companies today. Surveying 441 company representative, AIIM didn’t try to forecast the future so much as see where companies’ heads are today. AIIM’s report addresses both internal and external uses, but generally blurs the discussion between the two. It’s interesting to note the differences between the two reports. Forrester included podcasting as a leading area of spend for Enterprise 2.0. AIIM’s report includes podcasting as well, but survey participants didn’t include it very often in their current definitions of an Enterprise 2.0 platform. Forrester’s report did not include social bookmarking and tagging, but AIIM did. The Forrester omission probably says something about their view of the dollars to be spent on it. Forrester included widgets, which is a nod to their strong focus on external uses of Enterprise 2.0. AIIM’s respondents like collaborative filtering, which is the basis for recommendation engines. Social networking comes in strong on both analyst reports. Forrester has spending here running away from all others by 2013. Call this the Facebook effect (MySpace didn’t seem to inspire the same trend to the enterprise). Generally, Facebook controls its “borders” and has a handle on everything that’s going on. Relationships, groups and activities all occur within the walled garden. Enterprises share a lot of these characteristics. Social networks will become the next generation intranet. Also, note the disparity here. Companies are just coming to terms with the idea of social networks for employees, while the blogosphere seems to have left the mainstream social networks behind. Call that difference between the easy freedom of thinking and conversations, and the hard decisions of where to spend money and sweating your stock price. Wikis come in surprisingly low on the Forrester side of things. I say that because some of the best known uses of Web 2.0 technologies inside companies are wikis. In fact, wikis are the #1 thing that respondents consider to be Enterprise 2.0 in the AIIM survey. Perhaps they have a lower cost, so that the same number of implementations will result in lower dollars spent. RSS comes in strong for both reports. That is great to see! RSS holds so much potential. Just look at the growth of FriendFeed to see how RSS can create really new and interesting applications. RSS inside the enterprise will increase information awareness, and can be a basis for research and discovery the way FriendFeed is on the consumer web. Blogs are ranked highly in both reports. Very nice to see. There’s still a mountain to climb before employees get comfortable with them. For companies that do have adoption of employee blogs, I expect there will be a boost in innovation. Company blogs are interesting animals. The worst way to roll those out is treat blogs as glorified press release vehicles. That would be a waste of time. But what do you put on a blog that would be interesting? A couple of companies serve as examples. Google’s blog has a very conversational style of its products, general technology issues and other geeky stuff. Cafepress’s blog talks a lot about their products, which could be boring as hell. But Cafepress manages to relate products to larger issues, which makes it a bit more interesting. Mashups are in the lower end of the top 7 currently, although Forrester projects spend on mashup technology to be the second highest after social networks. 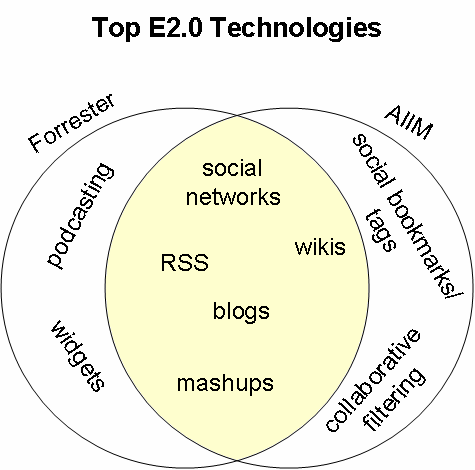 Here’s where I think Enterprise 2.0 will lead Web 2.0: mashup adoption. There are so many existing “big iron” software systems inside companies, that rip-and-replace is an expensive undertaking when you want to add new functionality. Mashups extend the life of these systems. In the consumer web, we’re experimenting with mashups a la Yahoo Pipes and Microsoft Popfly. I’m not sure the average consumer is going to bother with those. However, the average IT professional very much wants to look at mashups. Those are some general thoughts. What do you think about Enterprise 2.0?